The blackest and most tragic period in the life of Tiberius begins with the death of Germanicus and the terrible scandal of the suit against Piso. It was to pass into history as the worst period of the "Tiberian tyranny"; for it was at this time that the famous Lex de majestate  (on high treason), which had not been applied under Augustus, came to be frequently invoked, and through its operation atrocious accusations, scandalous trials, and frightful condemnations were multiplied in Rome, to the terror of all. Many committed suicide in despair, and illustrious families were given over to ruin and infamy. From a photograph of Anderson of the bust in the Museo Nazionale. Posterity still holds Tiberius to account for these tragedies; his cruel and suspicious tyranny is made responsible for these accusations, for the suits which followed, and for the cruel condemnations in which they ended. It is said that every free mind which still remembered ancient Roman liberty gave him umbrage and caused him distress, and that he could suffer to have about him only slaves and hired assassins. But how far this is from the truth! How poorly the superficial judgment of posterity has understood the terrible tragedy of the reign, of Tiberius! We always forget that Tiberius was the next Roman emperor after Augustus; the first, that is, who had to bear the weight of the immense charge created by its founder, but without the immense prestige and respect which Augustus had derived from the extraordinary good fortune of his life, from the critical moment in which he had taken over the government, from the general opinion that he had ended the civil wars, brought peace back to an empire in travail, and saved Rome from the imminent ruin with which Egypt and Cleopatra had threatened it. For these reasons, while Augustus lived, the envy, jealousy, rivalry, and hatred of the new authority were held in check in his presence; but they were ever smoldering in the Roman aristocracy, which considered itself robbed of a part of its privileges, and always felt itself humiliated by this same authority, even when it was necessary to submit to it in cases of supreme political necessity. But all this envy, all these jealousies, all these rivalries,—I have said it before, but it is well to repeat it, since the point is of capital importance for the understanding of the whole history of the first empire,—were unleashed when Tiberius was exalted to the imperial dignity. What in reality was the situation of Tiberius after the death of Germanicus? We must grasp it well if we wish to understand not only the cruelty of the accusations brought under the law of high treason, but also the whole family policy followed by the second emperor. It was he who had to bear the burden of the whole state, of the finances, of the supplies, of the army, of the home and foreign policies; his was the will that propelled, and the mind that regulated, all. To him every portion of the empire and every social class had recourse, and it was to him that they looked for redress for every wrong or inconvenience or danger. It was to him that the legions looked for their regular stipend, the common people of Rome for abundant grain, the senate for the preservation of boundaries and of the internal order; the provinces looked to him for justice, and the sovereign allies or vassals for the solution of all internal difficulties in which they became involved. These responsibilities were so numerous and so great that Tiberius, like Augustus, attempted to induce the senate to aid him by assuming its share, according to the ancient constitution; but it was in vain, for the senate sought to shield itself, and always left to him the heavier portion. From busts in the Museo Nazionale, Naples. Types of head-dresses worn in the time of the women of the Caesars. Is it conceivable that a man could have discharged so many responsibilities in times when the traditions of the government were only beginning to take form if he had not possessed a commanding personal authority, if he had not been the object of profound and general respect? Augustus would not have been able to govern so great an empire for more than forty years with such slight means had it not been for the fact, fortunate alike for himself and for the state, that he did enjoy this profound, sincere, and general admiration. Tiberius, on the other hand, who was already decidedly unpopular when he came into power, had seen this unpopularity increase during the first six years of his rule, despite all the efforts he had put forth to govern well. His solicitude about maintaining a certain order within the state was described as haughtiness and harshness, his preoccupation lest the precarious resources of the government be dissipated in useless expenditures was dubbed avarice, and the prudence which had impelled him to restrain the rash policy of expansion and aggression which Germanicus had tried to initiate beyond the Rhine was construed as envy and surly malignity. Against all considerations of justice, logic, or good sense, this accusation was repeated, and now that destiny had cut down Germanicus, he was accused sotto voce of being responsible for his death by many of the great families of Rome and even in senatorial circles. They treated it as most natural that through jealousy he should poison his own nephew, his adopted son, the popular descendant of Drusus, the son of that virtuous Antonia who was his best and most faithful friend! But if, after having been accepted as true by the great families of Rome who sent it on its rounds, such a report had been allowed to circulate through the empire, how much authority would have been left to an emperor who was suspected of so terrible a crime? How could he have maintained discipline in the army, of which he was the head, and order among the people of Rome, of whom, as tribune, he was the great protector? How could he have directed, urged on, or restrained the senate, of which he was, in the language of to-day, the president? The various Italian peoples from whom the army was drawn did not yet consider the head of the state a being so superior to the laws that it would be permissible for him to commit crimes which were branded as disgustingly repulsive to ordinary human nature. No historian who understands the affairs of the world in general, and the story of the first century of the empire in particular, will attribute to ferocity or to the tyrannical spirit of Tiberius the increasingly harsh application of the Lex de majestate which followed the death of Germanicus and the trial of Piso. This harshness was the natural reaction against the delirium of atrocious calumnies against Tiberius which raged in the aristocracy of that time and especially in the house of Agrippina. For she, in spite of the undeniably virtuous character of her private life, was influenced by friends who, for motives of political advancement took advantage of her passions and inexperience. Too credulous of Tacitus, many writers have severely characterized the facility and the severity with which the senate condemned those accused under the Lex de majestate: they consider it an indication of ignoble servility toward the emperor. Yet we know very well that the Roman senate at that time was not composed merely of adulators and hirelings; it still included many men of intelligence and character. We can explain this severity only by admitting that there were many persons in the senate who judged that the emperor could not be left defenseless against the wild slanders of the great families, since these extravagant and insidious calumnies compromised not only the prestige and the fame of the ruler, but also the tranquillity, the power, and the integrity of the empire. Undoubtedly the Lex de majestate did give rise in time to false accusations, to private reprisals, and to unjust sentences of condemnation. Although it had been devised to defend the prestige of the state in the person of the magistrates who represented it, the law was frequently invoked by senators who wished to vent their fiercest personal hatreds. Nor can it be denied that cupidity was the cause of many iniquitous calumnies directed against wealthy persons whose fortunes were coveted by their accusers. Yet we must go slow in accusing Tiberius of these excesses. Tacitus himself, who was averse to the emperor, recounts several incidents which show him in the act of intervening in trials of high treason for the benefit of the accused precisely for the purpose of hindering these excesses of private vengeance. The accounts which we have of many other trials are so brief and so biased that it is not fair for us to hazard a judgment. We do know, however, that after the death of Germanicus there was formed at Rome, in the imperial family and the senate, a party of Agrippina, which began an implacable war upon Tiberius, and that Tiberius, the so-called tyrant, was at the beginning very weak, undecided, and vacillating in his resistance to this new opposition. His opponents did not spare his person; they did their best to spread the belief that the emperor was a poisoner, and persecuted him relentlessly with this calumny; they were already pushing forward Nero, the first-born son of Germanicus, though in 21 A.D. he was only fourteen years old, in order that he might in time be made the rival of Tiberius. The latter, indeed, tried at first to moderate the charges of high treason, his supreme defense; he feigned that he did not know or did not see many things, and instead of resisting, he began to make long sojourns away from Rome, thus turning over the capital, in which the pretorian guard remained, to the calumnies of his enemies. Of all these enemies the most terrible was Agrippina, who, passionate, vehement, without judgment, abused in good faith both the relationship which protected her and the pity which her misfortune had aroused. She allowed no occasion for taunting Tiberius with his pretended crime to escape her, using to this end not only words, but scenes and actions, which impressed the public even more strongly than open accusations could have done. A supper to which Tiberius had invited her became famous at Rome, for at it she refused obstinately and ostentatiously to touch any food or drink whatever, to the astonishment of the guests, who understood perfectly what her gestures meant. And such calumnies and such affronts Tiberius answered only with a weary and disdainful inertia; at most, when his patience was exhausted, some bitter and concise reproof would escape him. I have no doubt that Tiberius had resolved at the beginning to avoid all harsh measures as far as possible; for unpopular, misunderstood, and detested as he was, he did not dare to use violence against a large part of the aristocracy and against his own house. Furthermore, Agrippina was the least intelligent of the women of the family, and her senseless opposition could be tolerated as long as Livia and Antonia, the two really serious ladies of the family, sided with Tiberius. But it is easy to understand that this situation could not long endure. A power which defends itself weakly against the attacks of its enemies is destined to sink rapidly into a decline, and the party of Agrippina would therefore quickly have gained favor and power had there not arisen, to sustain the vacillating strength of Tiberius, a man whose name was to become sadly famous—Sejanus—the commander of the pretorian guard. Sejanus belonged to an obscure family of knights—to what we should now call the bourgeoisie. He was not a senator, and he held no great political position; for his charge as commander of the guard was a purely military office. In ordinary times he would have remained a secondary personage, exclusively concerned with the exacting duties of his command; but the party of Agrippina with its intrigues, and the weakness and uncertainty of Tiberius, made of him, however, for a certain time, a formidable power. It is not difficult to see whence this power arose. The loyalty of the pretorian guard, upon which depended the security and the safety of the imperial authority, was one of the things which must seriously have preoccupied Tiberius, particularly in the face of the persistent and insidious intrigues and accusations of the party of Agrippina. The guard lived at Rome, in continual contact with the senate and the imperial house. Everything which was said in the senatorial circles or in the palaces of the emperor or of his relatives was quickly repeated among the cohorts, and the memory of Drusus and Germanicus was deeply venerated by the pretorians. If the guard could have been persuaded that the emperor was a poisoner of his kindred, their loyalty would have been exposed to numberless intrigues and attempts at seduction. In such a condition of affairs, a commander of the guard who could inspire Tiberius with a complete and absolute trust might easily acquire a great influence over him. Sejanus knew how to inspire this trust. This was partly by reason of his origin, for the equestrian order, on account of its ancient rivalry with the senatorial nobility, was more favorably inclined than the latter toward the imperial authority; and partly also on account of certain reforms which he had succeeded in introducing into the pretorian guard. From the painting by Albert Baur. Owned by Mr. Henry Schultheis. A Roman feast in the time of the Caesars. Once he had acquired the emperor's confidence, the ambitious and intelligent prefect of the pretorians proceeded to render himself indispensable in all things. The moment was favorable; Tiberius was becoming more and more wearied of his many affairs, of his many struggles, of his countless responsibilities; more and more disgusted with Rome, with its society, with the too frequent contact with the men whom it was his fate to govern. He was in the earlier stages of that settled melancholy which grew deeper and deeper in the last ten years of his life, and which had grown upon him as the result of long antagonisms, of great bitterness, and of continual terrors and suspicions; and if it is true that Tiberius was addicted to the vice of heavy drinking, as we hear from ancient writers, the abuse of wine may also have had its part in producing it. The tyrant, as historians have been pleased to call him, did actually seem to weaken in the fight for those ideals in which he had so long and so ardently believed. He tried to please the people by advocating no measures that might seem harsh or excessive to them. He even resisted, in the year 22 A.D., the pressure that his own party—his own puritan party—brought to bear upon him to apply with the utmost severity and discipline the laws against the fast increasing luxury of the men and women of his day. His reply to such pressure was a letter to the senate in which he deplored, among other things, the passion that so many women were showing for jewels and precious stones imported from distant countries. He maintained that it was the fault of such women that so much gold left the country and pointed out how much more wisely the money could be spent in fortifying the boundaries of the empire. In view of all this it is not difficult to understand why the man who for many years had done everything for himself, who had never wished to have either counselors or confidants about him, now that he was growing old needed the support of younger energies and of stronger wills. But in his family he could rely only upon his son Drusus, who had now become a serious and trustworthy man, and in the year 22 A.D. he asked the senate that it concede to his son the tribunician power; that is, that they make him his colleague. But the son did not suffice, and Sejanus therefore succeeded in making himself, together with Drusus, in fact, if not in name, the first and most active and influential collaborator and counselor of Tiberius. He was even more active and influential than Drusus, for the latter was frequently absent on distant military missions to the confines of the empire, while Sejanus, as commander of the pretorian guard, was virtually always at Rome, where the emperor now appeared less and less frequently. Such was the origin of the anomalous power of this man, who was not even a senator—a power which was the result of the weakness of Tiberius and of the fierce discords which divided the aristocracy; and it was a power which must of necessity prove disastrous, especially to the party of Agrippina and Germanicus. Although indications are not lacking that there was no great harmony or friendship between Sejanus and Drusus, it is evident that Sejanus, as the energetic representative of the interests of Tiberius, must have directed all his efforts against the friends of Agrippina, who was arousing the fiercest opposition to the emperor. But in the year 23, an unforeseen event seemed suddenly to change the situation and to render possible a reconciliation between Tiberius and the party of Agrippina. In this year, Drusus also, like so many other members of his family, died prematurely, at the age of thirty-eight, and on this occasion, for the time being, at least, no one raised the cry of poisoning. This unexpected misfortune moved Tiberius profoundly, for he dearly loved his son, and it seemed for a moment to determine the triumph of Agrippina's party. Now that his son had been taken from him, where, if not among the sons of Germanicus and Agrippina, could Tiberius look for a successor? And, as a further proof that Tiberius desired as far as possible to avoid conflict in the bosom of his family, he did not hesitate a moment, despite all the annoyances and difficulties which he had suffered at the hands of Agrippina and her friends. He officially recognized that in the sons of Germanicus were henceforth placed the future hopes of his family and of the empire. Of the two elder, Nero was now sixteen and Drusus was somewhat younger, though we do not know his exact age. These he summoned to appear before the senate, and he presented them to the assembly with a noble discourse the substance of which Tacitus has preserved for us, exhorting the youths and the senate to fulfil their respective duties for the greatness and the prosperity of the republic. From a drawing of Andre Castaigne. Depositing the ashes of a member of the imperial family in a Roman columbarium. After the death of Drusus, therefore, a reconciliation became possible in the family of the Caesars. The latent rivalry between the families of Tiberius and Germanicus was extinguished. Indeed, even in the midst of the tears shed for the early death of Drusus, a gleam of concord seems to have shone down upon the house desolated by many tragedies, while Sejanus, whose power depended upon the strife of the factions, was for a moment set aside and driven back into the shadows. But it was not to continue long; for soon the flames of discord broke out more violently than ever. Whom shall we blame, Sejanus or Agrippina? Tacitus says that it was the fault of Sejanus, whom he accuses of having tried to destroy the descendants of Germanicus, in order to usurp their place: but he himself is forced to admit in another passage (Annals iv., 59) that virtually a little court of freedmen and dependents gathered about Nero, the leader of the sons of Germanicus, urging him on against Tiberius and Sejanus, and begging him to act quickly. "This," they said, "is the will of the people, the desire of the armies. Nor would Sejanus, who was even then making light of the patience of the old man and of the dilatoriness of the youth, have dared to resist him." From such speeches it is only a short step to plans for rebellion and conspiracy. In all probability the blame for this later and more bitter dissension must, as usually happens, be divided between the two factions. The party of Agrippina, emboldened by its good fortune and by the weakness of Tiberius, was, after the death of Drusus, conscious of its own supremacy. Its members had only a single aim; even before it was possible they wished to see Nero, the first-born son of Germanicus, in the position of Tiberius. They therefore took up again their struggles and intrigues against Tiberius, and attempted to incite Nero against the emperor. But this time Sejanus was blocking their pathway. The death of Drusus had even further increased the trust and affection which the emperor had for his assistant, and he was henceforth the only confidant and the only friend of the emperor; a war without quarter between him and Agrippina, her sons and the party of Germanicus, was inevitable. And Sejanus opened the action by attempting to exclude from the magistracy and from office all the friends of Agrippina and all the members of the opposing faction. At this time it was difficult to arrive at any of the more important offices without being recommended to the senate by the emperor, against whose choice the senate no longer dared to rebel; since the emperor was held responsible for the conduct of the government, it was only just that he should be allowed to select his more important collaborators. Sejanus was therefore able, by using his influence over Tiberius, to lay a thousand difficulties and obstacles in the way of even the legitimate ambitions of the most eminent men of the opposite faction. Nor were these the only weapons employed; others no less efficacious were called into play, and intrigues, calumnies, accusations, and trials were set on foot without scruple and with a ferocity the horror of which Tacitus has painted with indelible colors. Among these intrigues two matrimonial projects must be mentioned. In the year 25 Sejanus attempted a bold stroke; he repudiated his wife Apicata, and asked Tiberius for the hand of Livilla (Livia), the widow of Drusus. Sejanus had frequented the political aristocracy of the empire, and, despite his equestrian origin, was quick to adopt not only their ambitions and their manners, but also their ideas on marriage. He, too, considered it as simply a political instrument, a means of acquiring and consolidating power. He had therefore disrupted his first family in order to contract this marriage, which would have redoubled his power and his influence and have introduced him into the imperial household. But his bold stroke failed, because Tiberius refused; and he refused, Tacitus tells us, above all because he was afraid that this marriage would still further irritate Agrippina. The emperor is supposed to have told Sejanus that too many feminine quarrels were already disturbing and agitating the house of the Caesars, to the serious detriment of his nephew's sons. And what would happen, he asked, if this marriage should still further foment existing hatreds? Quid si intendatur certamen tali conjugio? The reply is significant, because it proves to us that Tiberius, who is accused of harboring a fierce hate against the sons of Germanicus and Agrippina, was still seeking, two years after the death of Drusus, to appease both factions, attempting not to irritate his adversaries and to preserve a reasonable equanimity in the midst of these animosities and these struggles. The starving Livilla refusing food. In any case, Sejanus was refused, and this refusal was a slight success for the party of Agrippina, which, a year later, in 26, attempted on its own account an analogous move. Agrippina asked Tiberius for permission to remarry. If we are to believe Tacitus, Agrippina made this request on her own initiative, impelled by one of those numerous and more or less reasonable caprices which were continually shooting through her head. But are we to suppose that suddenly, after a long widowhood, Agrippina put forth so strange a proposal without any arrière-pensée whatever? Furthermore, if this proposal had been merely the momentary caprice of a whimsical woman, would it have been so seriously debated in the imperial household, and would the daughter of Agrippina have recounted the episode in her memoirs? It is more probable that this marriage, too, had a political aim. By giving a husband to Agrippina, they were also seeking to give a leader to the anti-Tiberian party. The sons of Germanicus were too young, and Agrippina was too violent and tactless, to be able alone to cope successfully with Sejanus, supported as he was by Tiberius, by Livia, and by Antonia. We can thus explain why Tiberius opposed and prevented the marriage: Agrippina, unassisted, had caused him sufficient trouble; it would have been entirely superfluous for him to sanction her taking to herself an official counselor in the guise of a husband. This time Sejanus triumphed over the ill success of his rivals, and the struggle continued in this manner between the two parties, but with an increasing advantage to Sejanus. Beginning with the year 26, we see numerous indications that the party of Agrippina and Germanicus was no longer able to resist the blows and machinations of Sejanus, who detached from it, one after another, all the men of any importance. He either won them over to himself through his favors and his promises, or he frightened them with his threats; and those who resisted most tenaciously, he destroyed with his suits. Tiberius was the storm-center of these struggles, and contrary to what legend has reported, he attempted as far as he was able to prevent the two parties from going to extremes. But what pain, repugnance, and fatigue it must have cost him to make the effort necessary for maintaining a last ray of reason and justice among so many evil passions, animosities, ambitions, and rivalries! It must have cost him dearly, for he had grown up in the time when the dream of a great restoration of the aristocracy was luring the upper classes of Rome with its fairest and most luminous smile. As a young man he had known and loved Vergil, Horace, and Livy, the two poets and the historian of this great dream; like all the elect spirits of those now distant years, he had seen behind this vision a great senate, a glorious and terrible army, an austere and revered republic like that which Livy had pictured with glowing colors in his immortal pages. Instead of all this, he was now forced to take his place at the head of this decadent and wretched nobility, which seemed to be interested only in rending itself asunder with calumnies, denunciations, suits, and scandalous condemnations, and which repaid him for all that he had done and was still doing for its safety and the prosperity of the empire by directing against his name the most atrocious calumnies, the fiercest railleries, and every sort of ridiculous and infamous legend. He had dreamed of victories over the enemies of Rome, and he had to resign himself to struggling day and night against the hysterical extravagance of Agrippina: he had to be content, even without the sure hope of success, if he could convince the majority that he was not a poisoner. Authority without glory or respect, power divorced from the means sufficient for its exercise—such was the situation in which the successor of Augustus, the second emperor, after twelve years of a difficult and trying reign, found himself. He no longer felt himself safe at Rome, where he feared rightly or wrongly that his life was being continually threatened, and it is not astonishing that, old, wearied, and disgusted, between the years 26 and 27 he should have retired definitely to Capri, seeking to hide his misanthropy, his weariness, and his disgust with men and things in the wonderful little isle which a delightful caprice of nature had set down in the lap of the divine Bay of Naples. But instead of the peace he sought at Capri, Tiberius found the infamy of history. How dark and terrible are the memories of him associated with the charming isle, which, violet-tinted, on beautiful sunny days emerges from an azure sea against an azure sky! That fragment of paradise fallen upon the shore of one of the most beautiful seas in the world is said to have been for about ten years a hell of fierce cruelties and abominable vices. Tiberius passed sentence upon himself, in the opinion of posterity, when he secluded himself in Capri. Ought we, without a further word, to transcribe this sentence? There are, to be sure, no decisive arguments to prove false the accounts about the horrors of Capri which the ancients, and especially Suetonius, have transmitted to us; there are some, however, which make us mistrust and withhold our judgment. Above all, we have the right to ask ourselves how, from whom, and by access to what sources did Suetonius and the other ancients learn so many extraordinary details. It must be remembered that all the great figures in the history of Rome who had many enemies, like Sylla, Caesar, Antony, and Augustus himself, were accused of having scandalous habits. Precisely because the puritan tradition was strong at Rome, such an accusation did much harm, and for this reason, whether true or false, enemies were glad to repeat it whenever they wished to discredit a character. Lastly, all the ancient writers, even the most hostile, tell us that up to a ripe age Tiberius preserved his exemplary habits. Is it likely, then, that suddenly, when already old, he should have soiled himself with all the vices? At all events, if there is any truth contained in these accounts, we can at most conclude that as an old man Tiberius became subject to some mental infirmity and that the man who took refuge at Capri was no longer entirely sane. Certain it is, in any case, that after his retirement to Capri, Tiberius seriously neglected public affairs, and that Sejanus was finally looked upon at Rome as the de facto emperor. The bulletins and reports which were sent from the empire and from Rome to the emperor passed through his hands, as well as the decisions which Tiberius sent back to the state. At Rome, in all affairs of serious or slight importance, the senators turned to Sejanus, and about him, whom all fell into the habit of considering as the true emperor, a court and party were formed. In fear of his great power, the senators and the old aristocracy suppressed the envy which the dizzy rise of this obscure knight had aroused. Rome suffered without protest that a man of obscure birth should rule the empire in the place of a descendant of the great Claudian family, and the senators of the most illustrious houses grew accustomed to paying him court. Worse still, virtually all of them aided him, either by openly favoring him or by allowing him a free hand, to complete the decisive destruction of the party and the family of Germanicus,—of that same Germanicus of whom all had been fond and whose memory the people still venerated. From the statue in Rome. After the retirement of Tiberius to Capri, all felt that Agrippina and her sons were inevitably doomed sooner or later to succumb in the duel with the powerful, ambitious, and implacable prefect of the pretorians who represented Tiberius at Rome. Only a few generous idealists remained faithful to the conquered, who were now near their destruction; such supporters as might possibly ease the misery of ruin, but not ward it off or avoid it. Among these last faithful and heroic friends was a certain Titius Sabinus, and the implacable Sejanus destroyed him with a suit of which Tacitus has given us an account, a horrible story of one of the most abominable judicial machinations which human perfidy can imagine. Dissensions arose to aggravate the already serious danger in which Agrippina and her friends had been placed. Nero, the first-born son, and Drusus, the second, became hostile at the very moment when they should have united against the ruthless adversary who wished to exterminate them all. A last rock of refuge remained to protect the family of Germanicus. It was Livia, the revered old lady who had been present at the birth of the fortunes of Augustus and the new imperial authority, and who had held in her arms that infant world which had been born in the midst of the convulsions of the civil wars, and a little later had watched it try its first steps on the pathway of history. Livia did not much love Agrippina, whose hatred and intrigues against Tiberius she had always blamed; but she was too wise and too solicitous of the prestige of the family to allow Sejanus entirely to destroy the house of Germanicus. As long as she lived, Agrippina and Nero could dwell safely in Rome. But Livia was feeble, and in the beginning of 29, at the age of eighty-six, she died. The catastrophe which had been carefully prepared by Sejanus was now consummated; a few months after the death of Livia, Agrippina and Nero were subjected to a suit, and, under an accusation of having conspired against Tiberius, were condemned to exile by the senate. Shortly after his condemnation, Nero committed suicide. The account which Tacitus gives us of this trial is obscure, involved, and fragmentary, for the story is broken off at its most important point by an unfortunate lacuna in the manuscript. The other historians add but little light with their brief phrases and passing allusions. We do not therefore entirely understand either the contents of the charges, the reason for the condemnation, the stand taken by the accused, or the conduct of Tiberius with regard to the accusation. It seems hardly probable that Agrippina and Nero could have been truly guilty of a real conspiracy against Tiberius. Isolated as they had been by Sejanus after the retirement of Tiberius to Capri, they would scarcely have been able to set a conspiracy on foot, even if they had so desired. They were paying the penalty for the long war of calumnies and slanders which they had waged upon Tiberius, for the aversion and the scorn which they had always shown for him. In this course of conduct many senators had encouraged them as long as Tiberius alone had not dared to have recourse to violent and cruel measures in order to make himself respected by his family. But such acts of disrespect became serious crimes for the unfortunate woman and her hapless son, even in the eyes of the senators who had encouraged them to commit them, now that Sejanus had reinvigorated the imperial authority with his energy, and now that all felt that behind Tiberius and in his name and place there was acting a man of decision who knew how to punish his enemies and to reward his friends. The trial and condemnation of Agrippina and Nero were certainly the machinations of Sejanus, who carried along with him not only the senate and the friends of the imperial family, but perhaps even Tiberius himself. They prove how much Sejanus had been able to strengthen imperial authority, which had been hesitating and feeble in the last decade. Sejanus had dared to do what Tiberius had never succeeded in doing; he had destroyed that center of opposition which gathered about Agrippina in the house of Germanicus. It is therefore scarcely necessary to say that the ruin of Agrippina still further increased the power of Sejanus. All bowed trembling before the man who had dared humiliate the very family of the Julio-Claudii. Honors were showered upon his head; he was made senator and pontifex; he received the proconsular power; there was talk of a marriage between him and the widow of Nero; and it was finally proposed that he be named consul for five years. Indeed, in 31, through the will of Tiberius, he actually became the colleague of the emperor himself in the consulate. He needed only the tribunician power to make him the official collaborator of the emperor and his designated successor. Every one at Rome, furthermore, considered him the future prince. From a photograph. Copyright by Anderson. Remains of the House of the Vestal Virgins. But having arrived at this height, Sejanus's head was turned, and he asked himself why he should exercise the rule and have all its burdens and dangers while he left to others the pomp, the honors, and the advantages. Although Tiberius allowed the senate to heap honors upon his faithful prefect of the pretorians, and though he himself showed his gratitude to him in many ways, even going to the point of being willing to give him the widow of Nero in marriage, he never really expected to take him as his colleague or to designate him as his successor. Tiberius was a Claudian, and that a knight without ancestry should be placed at the head of the Roman aristocracy was to him unthinkable; after the exile of Nero he had cast his eyes upon Caius, another son of Germanicus, as his possible successor. Nor had he hidden his intention: he had even clearly expressed it in different speeches to the senate. Therefore Sejanus must finally have come to the conclusion that if he continued to defend Tiberius and his interests, he could no longer hope for anything from him, and might even compromise the influence and the popularity which he had already acquired. Tiberius was hated and detested, there was a numerous party opposed to him in the senate, and he was extremely unpopular among the masses. Many admired Sejanus through spiteful hatred of Tiberius, for it amounted to saying that they preferred to be governed by an obscure knight rather than by an old and detested Claudian who had shut himself up in Capri. And thus Sejanus seems to have deluded himself into believing that if he succeeded in doing away with the emperor, he could easily take his position by setting aside the young son of Germanicus and profiting by the popularity which the fall of Tiberius would bring him. Little by little he came to an understanding with the enemies of Tiberius and prepared a conspiracy for the final overthrow of the odious government of the son of Livia. Many senators had agreed to this, and certainly few conspiracies were ever organized under more favorable auspices. Tiberius was old, disgusted with everything and everybody, and alone in Capri; he had virtually not a single friend in Rome; what happened in the world he knew only through what Sejanus told him. He was therefore entirely in the hands of the man who was preparing to sacrifice him to the tenacious hatred of the people and the senatorial aristocracy. Young, energetic, and the favorite of fortune, Sejanus had with him a formidable party in the senate, he was the commander of the pretorian guard,—that is, of the only military force stationed in Italy,—and he had terrified with his implacable persecutions all those whom he had failed to win over through his promises or his favors. Could the duel between this misanthropic old man and this vigorous, energetic, ruthless climber end in any other way than with the defeat of the former? From a photograph by Alineri of the marble in the Uffizi. Bust, supposed to be of Antonia—daughter of Mark Antony and Octavia—and mother of Germanicus. But now stepping forward suddenly from the shadows to which she had retired, a lady appeared, threw herself between the two contestants, and changed the fate of the combat. It was Antonia, the daughter of the famous triumvir, the revered widow of Drusus. 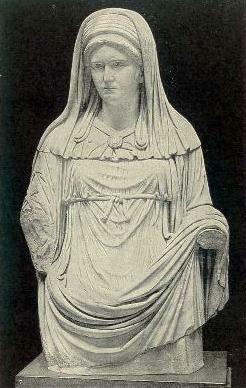 After the death of Livia, Antonia was the most respected personage of the imperial family in Rome. She still watched, withdrawn but alert, over the destiny of the house now virtually destroyed by death, dissensions, the cruelty of the laws, and the relentless anger of the aristocracy. It was she who scented out the plot, and quickly and courageously she informed Tiberius. The latter, in danger and in Capri, displayed again the energy and sagacity of his best period. The danger was most threatening, especially because Sejanus was the commander of the pretorian guard. Tiberius beguiled him with friendly letters, dangling in front of him the hope that he had conceded to him the tribunician power.—that is, that he had made him his colleague,—while at the same time he secretly took measures to appoint a successor for him. Suddenly Sejanus learned that he was no longer commander of the guard, and that the emperor had accused him before the senate of conspiracy. In an instant, under this blow, the fortunes of Sejanus collapsed. The envy and the latent hatred against the parvenu, the knight who had risen higher than all others, and who had humiliated the senatorial aristocracy with his good fortune, were reawakened, and the senate and public opinion turned fiercely against him. Sejanus, his family, his friends, his accomplices, and those who seemed to be his accomplices, were put to death after summary trials by the fury of the mob; and in Rome blood flowed in torrents. Antonia might now have enjoyed the satisfaction of having saved through her foresight not only Tiberius, but the entire family, when suddenly one of the surges of that fierce tempest of ambitions and hatreds tore from her side even her own daughter, Livilla, the widow of Drusus, and cast her as a prey into that sea of blind popular frenzy. The reader has perhaps not forgotten that eight years before, when Sejanus was hoping to marry Livilla, he had repudiated his first wife, Apicata. Apicata had not wished to outlive the ruin of her former husband, and she killed herself, but only after having written Tiberius a letter in which she accused Livilla of having poisoned Drusus through connivance with Sejanus, whom she wished to marry. I confess that this accusation seems to me hardly probable, and I do not believe that the denunciation of Apicata is sufficient ground for admitting it. Above all, it is well to inquire what proofs Apicata could have had of this crime, and how she could have procured them even if the crime had been committed. Since the two accomplices would have been obliged to hide their infamous deed from all, there was no one from whom they would have concealed it more carefully than from Apicata. We must further note that it is not probable that a cautious man, as Sejanus was in the year 23, would have thought of committing so serious a crime as that of poisoning the son of his protector. For what reason would he have done so? He did not then think of succeeding Tiberius; by removing Drusus, he would merely have improved the situation of the family of Germanicus, which at that time was already hostile to him and with which he was preparing to struggle. Instead, might not this accusation in extremis be the last vengeance of a repudiated woman against the rival who for a moment had threatened to take the position from which she herself had been driven? Apicata did not belong to the aristocracy, and, unlike the ladies of the senatorial families, she had not therefore been brought up with the idea of having to serve docilely as an instrument for the political career of her own husband. Perhaps her denunciation was the revenge of feminine jealousy, of that passion which the lower orders of Roman society did not extinguish in the hearts of their women as did the aristocracy. This denunciation, however,—we know this from the pages of ancient writers,—was one of the most terrible griefs of Tiberius's old age. He had loved his son tenderly, and the idea of leaving so horrible a crime unpunished, in case the accusation was true, drove him to desperation. Yet, on the other hand, Livilla, the presumptive criminal, was the daughter of his faithful friend, of that Antonia who had saved him from the treacheries of Sejanus. As for the public, ever ready to believe all the infamies which were reported of the imperial house, it was firmly convinced that Livilla was an abominable poisoner. A great trial was set on foot; many suspects were put to torture, which is evidence that they were arriving at no definite conclusions, and this was probably because they were seeking for the proofs of an imaginary crime. Livilla, however, did not survive the scandal, the accusations, the suspicions of Tiberius, and the distrust of those about her. Because she was the daughter of Drusus and the daughter-in-law of Tiberius, because she belonged to the family which fortune had placed at the head of the immense empire of Rome, she would not be able to persuade any one that she was innocent. The obscure woman, without ancestry, who was accusing her from the grave, would be taken at her word by every one; she would convince posterity and history; against all reason she would prevail over the greatness of Livilla! So Livilla took refuge in her mother's house and starved herself to death, for she was unable to outlive an accusation which it was impossible to refute. Tiberius's reign continued for six years after this terrible tragedy, but it was only a species of slow death-agony. The year 33 saw still another tragic event—the suicide of Agrippina and her son Drusus. Of the race of Germanicus there remained alive only one son, Caius (the later Emperor Caligula), and three daughters, of whom the eldest, Agrippina, the mother of Nero, had been married a few years before to the descendant of one of the greatest houses of Rome, Cnaeus Domitius Enobarbus*. Tiberius still remained as the last relic of a bygone time to represent ideas and aspirations which were henceforth lost causes, amid the ruins and the tombs of his friends. Posterity, following in the footsteps of Tacitus, has held him and his dark nature alone responsible for this ruin. We ought to believe instead that he was a man born to a loftier and more fortunate destiny, but that he had to pay the penalty for the unique eminence to which fortune had exalted him. Like the members of his family who had been driven into exile, who had died before their time, who had been driven to suicide in despair, he, too, was the victim of a tragic situation full of insoluble contradictions; and precisely because he was destined to live, he was perhaps the most unfortunate victim of them all. * This should be Cnaeus Domitius Ahenobarbus. ↑ There was in the Roman legal system no public prosecutor and virtually no police. Every Roman citizen was supposed to watch over the laws and see that they were not infringed. On his retirement from office, any governor or magistrate ran the risk of being impeached by some young aspirant to political honors, and not infrequently oratory, an art much cultivated by the Romans, triumphed over righteousness. In the earlier period the ground on which charges were usually brought was malversation; in the time of the empire they were also frequently brought under the above-mentioned law de majestate. It has been said that this common act of accusation, the birthright of the Roman citizen, the greatly esteemed palladium of Roman freedom, became the most convenient instrument of despotism. Since he who could bring a criminal to justice received a fourth of his possessions and estates, and since it brought the accuser into prominence, delation was recklessly indulged in by the unscrupulous, both for the sake of gain and as a means of venting personal spite. The vice lay at the very heart of the Roman system, and was not the invention of Tiberius. He could hardly have done away with it without overthrowing the whole Roman procedure. This page was last edited on 17 April 2012, at 11:23.